On vacation this winter, I went "home" to Pakistan and India, which together have more than about 330 million Muslims (based on semi-official and official figures--cf. The Sachar Report on "Social, Economic and Educational Status of the MuslimCommunity of India" and various figures for Pakistan's population). Having actually lived in those countries, it is my starting assumption that most Muslims in those countries are moderates. But it can still be startling how moderate the vast majority of Muslims are, despite the inroads made by the Maududists, Qutbists, Wahabis, etc. There's a very fiery Mullah who gives sermons you can hear from inside my parents' home in Karachi. This is the kind of guy that, amongst other things, condemned Nawaz Sharif for having the temerity to lead an "Islamic Republic" while starting each day with a "gunah-e-kabira" (grevious sin)--shaving his face clean every morning. (Heard this with my own ears, by the way--and you have to remember that NS was the right-leaning half of our political yin-yang back then.) Anyway, so I had the opportunity to attend Friday prayers in "his" mosque again this December. 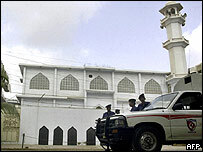 (Take a look at the picture above; see the little yellow'ish gate next to the mosque? My parents live 8 townhouses down the row behind it.) When he led the faithful in prayer at the end of the congregation, he, of course ended with "O Allah, help Muslims wherever they are in trouble and where they are oppressed," etc. And then, where I would challenge you to find a Western preacher (Muslim OR Christian) who would not have followed that up with a "...and bring down your wrath on the oppressors of my brothers," this gentleman went on to say "And the oppressors; Allah, give them guidance, help them see the light." Now you tell me the man's an unredeemable militant fanatic and/or terrorist. Big Ed on Anna Nicole, the Media and...Paris?